What a fun month of menus featuring a few favorite breakfast dishes it has been. 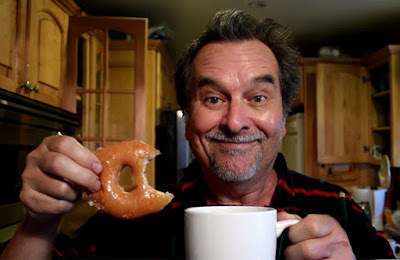 The 99 Cent Chef ends his early morning tasting menu with a video featuring a trip to his local 24 hour drive-thru Krispy Kreme Doughnuts shop, and a step-by-step recipe so you can create your own glazed wonders. What is it about a Krispy Kreme original glazed doughnut? Crusted with sugar, Krispy Kreme doughnuts are so soft, slight and featherweight you are left wanting more -- all for 89 cents apiece. When I first had them, I was reminded of powdered beignets from Cafe Du Monde in the French Quarter of New Orleans. Both are made with a yeast-risen dough; and, in fact, the original recipe for Krispy Kreme was purchased from a New Orleans French pastry chef over 70 years ago. The ingredients for this East Coast confection are simple and inexpensive: yeast, flour, sugar, milk, one egg and vanilla flavoring. Krispy Kreme's recipe is secreted away, so I am approximating. You can experiment with doughnut dough flavors, using different flours (wheat) and spices like cinnamon and nutmeg, or chocolate powder (or chocolate syrup), and fruit juice (or pureed fruit) instead of water. 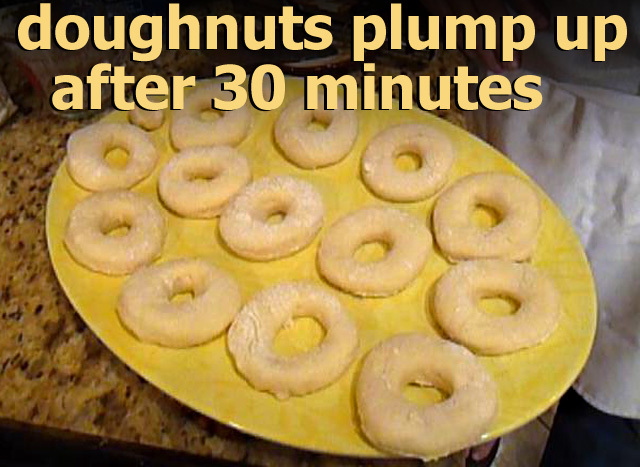 Watch the video -- it's easy to make a baker's dozen. Play it here. The video runs 7 minutes, 5 seconds. 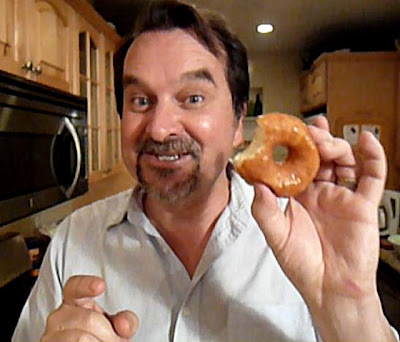 And if you liked this video, be sure to check out my Judging the Donut Summit 2, video below. It is chock full of crullers, dunkers, bear claws, chocolate glazes, and lemon filling. I recorded the outdoor park event while selecting best of show donuts, including: Best Vegan, Filling, Chocolate, Raised (Yeast), Fritter, Unconventional, and Visually Appealing. It was fun judging such a prestigious event. Highlights included an awards ceremony, Donut Croquet, and a Donut Poetry Slam -- be sure to listen to the hilarious limerick, "The Babysitter." To see photos and read more about it, click here. Play it here. The video runs 5 minutes, 34 seconds. 1/2 package yeast (video shows 1 package) - about 1 tablespoon of dried yeast. 2 cups flour - cheap, white all-purpose. Okay to try out different types for extra flavor and texture. 1/4 stick (28 grams) of butter or shortening - softened to room temperature. Melt butter and add to powdered sugar, vanilla and water. Mix well for a couple of minutes. Pour into shallow dish for dipping/coating warm doughnuts. For harder glaze leave out butter. *Here is a great website that converts my ingredients into grams (for all my international cook visitors), just click here. 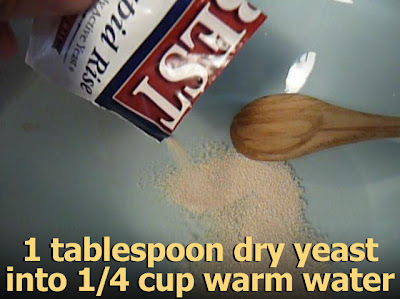 In a large mixing bowl, dissolve yeast in 1/4 cup of warm water, then add warm milk, egg, sugar, butter and flour. Mix well for a few minutes (electric mixer for 2, or 5 minutes by hand). Cover dough for at least a hour, or overnight for breakfast doughnuts. On a lightly floured surface, roll out doughnut dough with a rolling pin about 1/2 an inch thick. 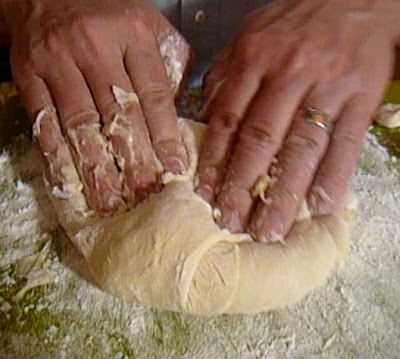 Dough is much softer and sticker than typical bread dough. To make it easier to work with sprinkle on flour as needed -- or just plop the dough on a floured board and pad it down out with your hands. 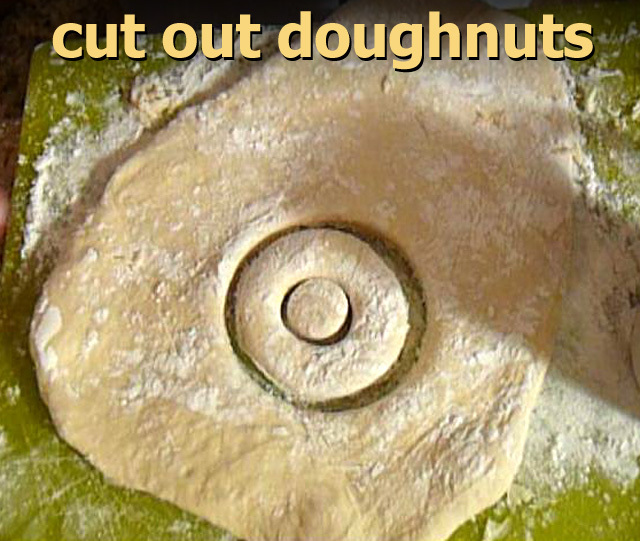 Cut doughnuts with a cutter (I used a coffee cup), then a smaller cutter (bottle top) for the centers. You can set aside the doughnut holes with the doughnuts or re-roll them for another doughnut or two. 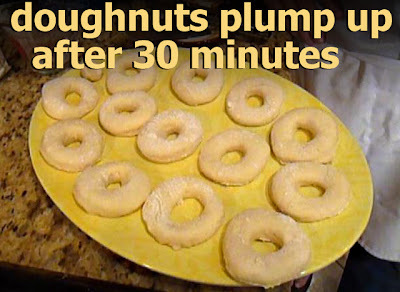 Let cut doughnuts set another half an hour to rise one last time before frying. 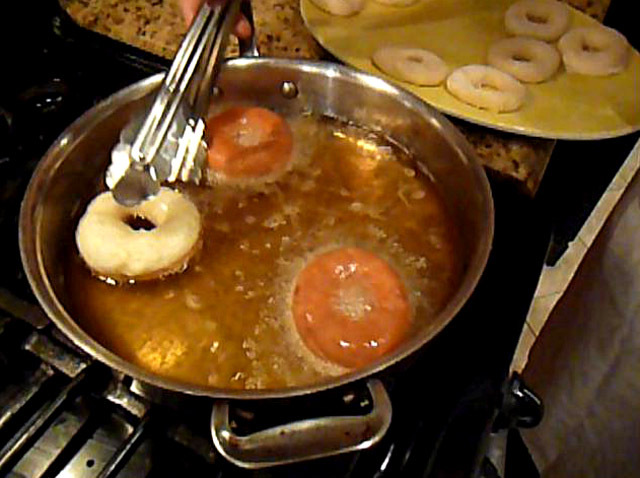 When doughnuts have risen, heat oil in a wide shallow pan to about 350 degrees (medium heat). Test one of the doughnut holes in the oil - it should bubble and quickly brown the doughnut hole. Fry one doughnut at a time until you get the hang of it - I burned a couple. Watch carefully, as doughnuts will begin to brown along the edge in a few seconds. Flip doughnut over to brown the other side. It may take a few tries - a light to medium brown doughnut is done enough. Set cooked doughnuts on a rack or on paper towels to drain. Finally, dip one side of doughnut in a shallow bowl of sugar glaze -- then enjoy! 99 thanks to the Baldwin Hills Krispy Kreme Doughnuts store, their employees and customers for allowing me to shoot video. Click here to view or embedd video from YouTube. And 99 thanks to Amy for her camerawork! Food is funny and so is coffee. In the last "Coffee Comedy" video, the silent movie pratfall device, the banana peel, was front and center. In my latest video, which features the bucolic ellipsoidal...well, you will have to watch what funny food prop The Chef has up his bathrobe sleeve. Play it here. The video runs 1 minute, 4 seconds. 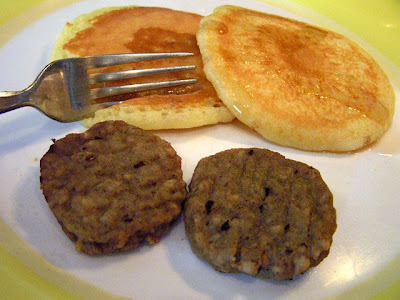 Not for the faint of palate, this breakfast double "Deal of the Day" is one hot mess. I fortified with a bottle of Tums and prune juice for cleansing. 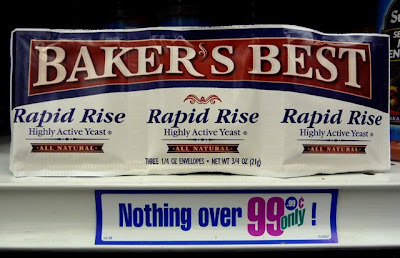 From the frozen case of this 99c only Store I picked up a "6-pack" of buttermilk pancakes by Breakfast Choice, and Armour "Sizzle & Serve Original" sausage patties (9-count). Both are pre-cooked, so this breakfast has the makings of an early morning speedy meal. After a week of healthy yogurt/fruit smoothies, veggie frittatas and whole grain cereal in soy milk, could this be a wicked worthwhile splurge of calories? It did not start out well. First up, "Breakfast Choice Buttermilk Pancakes". 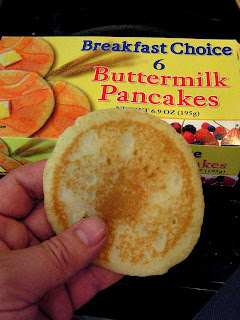 I tried toasting one small 3 1/2 inch diameter pancake, per box directions. The toaster rendered it tough and dry. I tried another one by microwaving 30 seconds, covered with a sheet of wax paper. This time it was moist, although I miss the crispness from toasting; and once covered in syrup, it is suprisingly flavorful - coming from a pre-cooked frozen state, although the flavor does not stand up to homemade or even box mix pancakes. On to Armour "Sizzle & Serve Original" sausage made from a combination of pork and turkey. 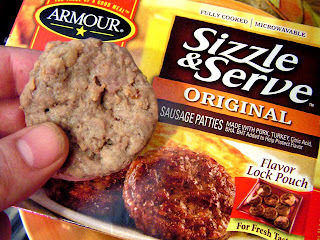 The box picture shows browned sausage patties; they actually look more like grey pucks. Once you get over that, they heat up quickly microwaved with the pancakes in about 30 seconds. The flavor is fine and does not render much grease with the addition of ground turkey, but once again, a crunchy caramelized skin from frying is sorely missed. On The 99 Cent Chef's scale of 0 to 9, 9 being best, I give this hot mess of a breakfast a 4. A few points are taken off for appearance and texture, and you would not eat this every day -- however as a trashy quickie morning meal fling, it's not bad! Click here to embed or view Coffee Comedy video #2 at youtube. 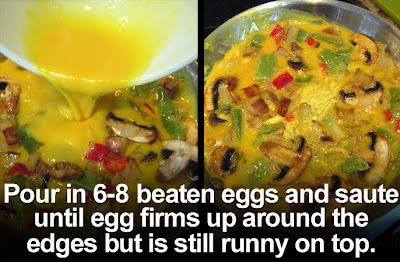 Scroll the colorful frittata photo story featuring The Chef preparing this classic Italian egg entree. 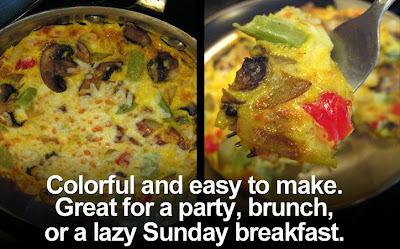 Typically, it is made with leftover pasta and eggs prepared in an ovenproof skillet. 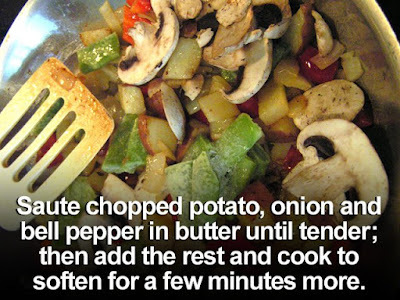 In this version, I substitute one small red (or white) potato and veggies including: a halved red bell pepper and onion, frozen Italian green beans, and half a package of sliced mushrooms. A cooking note: after adding 6-8 lightly mixed eggs to sauteed veggies use your spatula to loosen eggs around the edges of pan as frittata stiffens -- you do not scramble, let it firm up like an omelet. 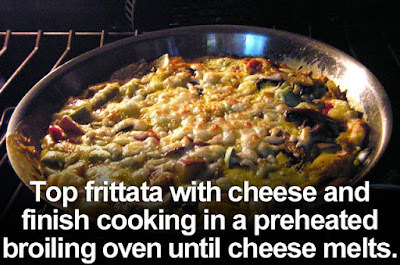 Finish in the broiling oven with a topping of mozzarella (or any favorite) cheese and barely cook a minute until melted. It's hard to mess up, since there are as many variations as you can come up with; just try not to over cook the eggs. You can feed the whole family with this dish. Enjoy The 99 Cent Chef's tasty photo story. 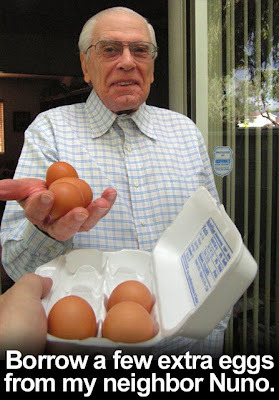 99 thanks to my neighbor Nuno for the extra eggs. Check out our earlier video collaboration: "My 99 Cent Dinner with Nuno" by clicking here. 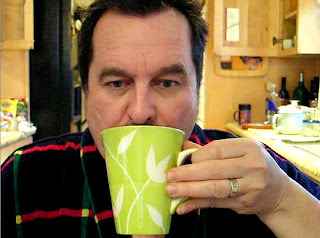 The first groggy-eyed cup of coffee - The 99 Cent Chef has gone through great pains for it. No fresh ground Starbucks left, maybe there's some old Folgers in the can way back in the cupboard. 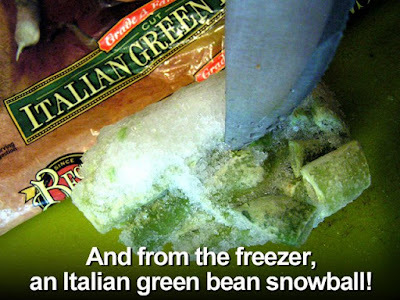 None left in the can, how about a couple of spoonfuls of freeze dried? No freeze dried, either? Watch this coffee comedy video to find out how desperate The Chef can be! now on to a tasty breakfast classic. 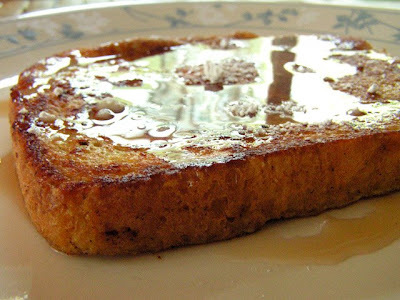 Texas Toast size bread is perfect for making French Toast. 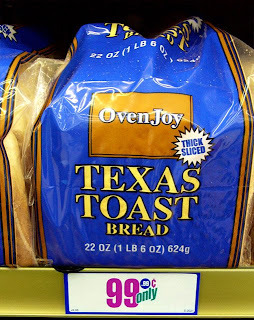 Pick up a loaf of thick-sliced white bread Texas Toast at this 99c only Store and make a stack. Continuing a month-long breakfast blogging theme, The Chef combines his earlier "Egg Nog & A Tipsy Tree Trimming" Christmas themed video recipe (click here to view video) with this warm and toasty breakfast favorite. You can use your preferred French bread recipe, just add a little of the spices: nutmeg, cinnamon and vanilla extract for a festive egg nog flavor. Heat a couple of slices of butter in large skillet on the stove top. 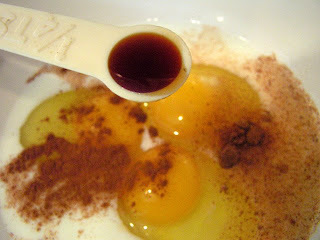 In a large bowl whisk together milk, eggs, sugar, cinnamon, nutmeg and vanilla extract. Dip and coat both sides of bread, allowing to soak through with egg nog wash. Cook until French toast is brown, about a couple of minutes each side. 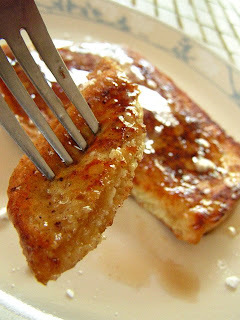 Sprinkle with powdered sugar and top with maple syrup. For a lighter version, forgo sugar and syrup and top with fresh cut strawberries, any seasonal fruit, or canned sliced peaches and pears in natural or lightly sweetened juice. Let's go Vegas baby. After an all night gambling binge hit Bellagio Hotel's breakfast brunch Eggs Benedict! You gotta break a few eggs to make this glitzy desert gamer's favorite. The Chef doesn't eat a lot of fried eggs and seldom an Eggs Benedict; however, when he gets the itch, he throws the dice and gets a winner's 7 or 11 with this recipe. The most difficult part of an Eggs Benedict is getting the Hollandaise sauce right (oops it curdled; oh no, it's runny; now it's thickened too much!). But with the Chef dealing, it's a sure bet the deck is stacked in your favor. Most recipes for Hollandaise use too many egg yolks and butter; just cut those ingredients by half (who needs all those calories?). For the Hollandaise sauce, plastic lemon juice is fine (although you only need the juice of half a fresh lemon); while butter is much more scarce, but shows up from time to time (butter keeps forever, so the Chef stocks up when he finds it). 99c only Stores always carry English muffins and usually, eggs - look in the cold deli case for sliced ham (or substitute a fist full of chopped spinach sauteed in a splash of olive oil for vegetarian). 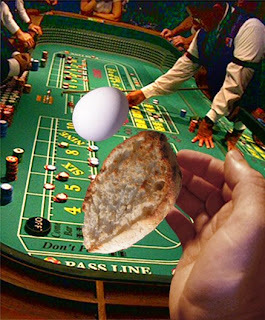 Come on, roll the dice; you will not come up snake eyes with The 99 Cent Chef's Vegas Eggs Benedict. 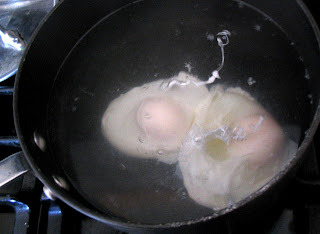 Prepare Hollandaise sauce while water/vinegar for poached eggs comes to a boil. Melt butter. 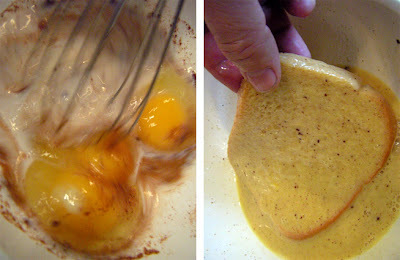 Separate egg yolk from whites and blender or whisk together yolks with lemon juice and water. Slowly add melted butter and finish blending. Pour Hollandaise in the pot you melted the butter in and keep warm over smallest burner and lowest setting of your stove top; it's important to continuously stir Hollandaise sauce for the first minute to keep it from curdling, and keep an eye on it, stirring frequently - add a teaspoon of water if it thickens too much. Turn down boiling water to low/medium boil; gently break and add eggs for 3 - 5 minutes of poaching (the Chef likes runny yolks, so 3 minutes max). After 30 seconds, run spoon carefully under eggs to keep them from sticking to pot. Start cooking ham and begin toasting muffins; all cooking should finish about the same time. Drain poached egg with slotted spoon. 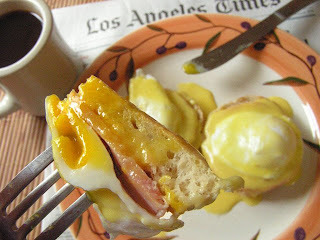 Assemble muffin, ham, egg and top with Hollandaise sauce. Welcome to a month of breakfast. Start your day with the The 99 Cent Chef's special morning menu. Every blogpost this month will feature budget breakfast entrees including a gamblers's favorite "Vegas Eggs Benedict", the photo story "Diary of a Frittata Maker", a couple of "coffee comedy" videos, and the following "Huevos Rancheros" recipe. Check back for those recipes and more! It is a special grand slam multi-media breakfast month of May presented by The 99 Cent Chef. This hearty Mexican breakfast is quick and easy following The 99 Cent Chef's method. 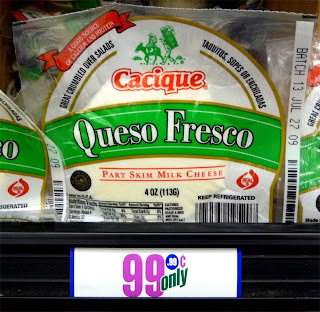 I got all my ingredients from this 99c Only Store, but any market stocks corn tortillas, eggs, cheese and salsa at budget prices. To get the cheese nice and melty just heat-up your favorite salsa on the stove top or microwave just before serving over cheese-topped eggs. There are many variations: instead of refried pinto beans, try it with black beans and top with white "queso fresco"- soft and crumbly Mexican cheese (similar to feta cheese, but milder), or instead of tomato salsa try a green chili sauce. With this recipe The Chef stays traditional. 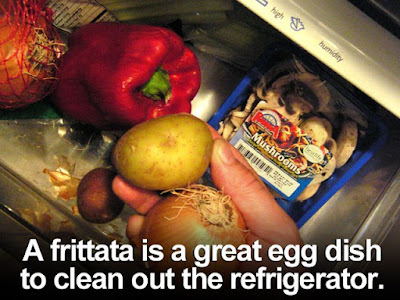 Eggs are commonly fried "sunny-side up", but you can fry it your way; this Chef likes when the eggs underside is crunchy. If you have any leftover refried beans, use them the next day scrambled together with eggs and make breakfast tacos, quite delicious and an early breakfast memory dish served when the family stayed with our grandmother "Big Mama". Use your favorite method of frying eggs. Heat corn tortilla in tbsp. of oil on grill or pan over medium heat, about 15 seconds on each side. Heat beans until hot on stove top or microwave. When eggs are 1/2 done add cheese on eggs to begin melting. Heat salsa in microwave until hot. 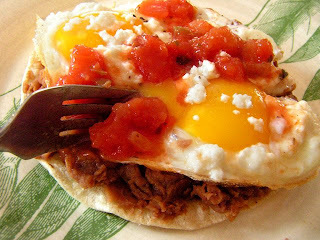 On a serving dish spread refried beans on a warm tortilla, add eggs with cheese and top with warm salsa. 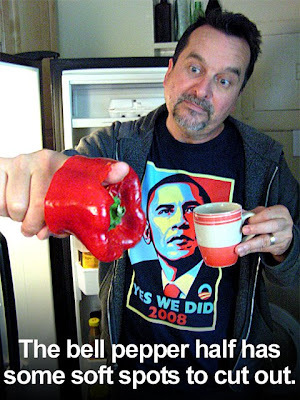 And don't forget the hot sauce!